Prime Minister Shinzo Abe’s tour of Latin America this summer will be the first Japanese state visit to the region in a decade. The last visit took place in 2004, when Junichiro Koizumi met with Mexican president Vicente Fox, Brazil’s president, Luiz Inacio Lula da Silva, and attended the Asia-Pacific Economic Cooperation (APEC) Economic Leaders’ Meeting in Santiago, Chile. Following a visit by Foreign Minister Fumio Kishida in May that included Mexico, Peru and Panama, Abe plans to make stops in Chile, Colombia, Brazil (home to about 2 million Japanese Brazilians), Trinidad and Tobago, and Mexico. Abe’s wide-ranging tour reflects Japan’s broadening economic and political agenda in Latin America. Bolstering foreign trade and investment, especially through vehicles such as the Trans-Pacific Partnership (TPP), is a critical element of the prime minister’s reform package intended to reverse chronic deflation and boost disappointing economic growth in Japan. As tensions increase between Tokyo and Beijing over a range of security and economic issues, Japan has also stepped up its diplomatic efforts around the world. A flurry of visits by Abe and other high-ranking officials to nations in Southeast Asia and Africa over the past six months produced multiple new accords. 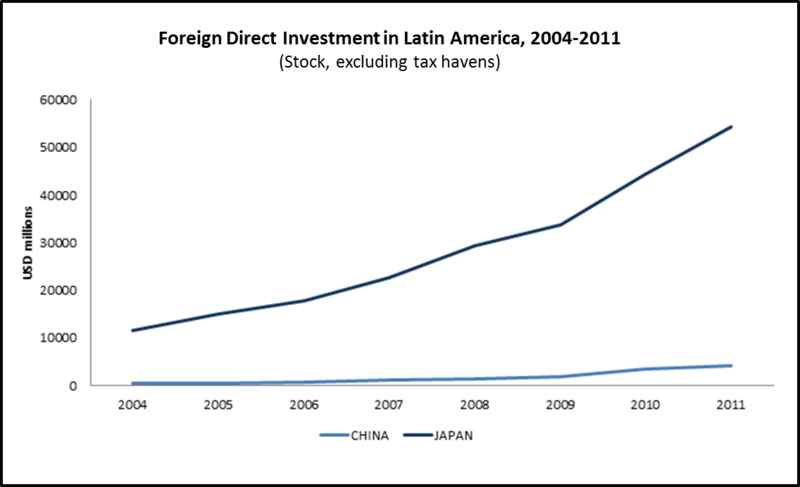 Trade remains a key driver of Japan’s economy and a cornerstone of the country’s foreign policy. While Japan’s trade with Latin America nearly doubled over the past decade, the region still accounts for just 5 percent of foreign trade. 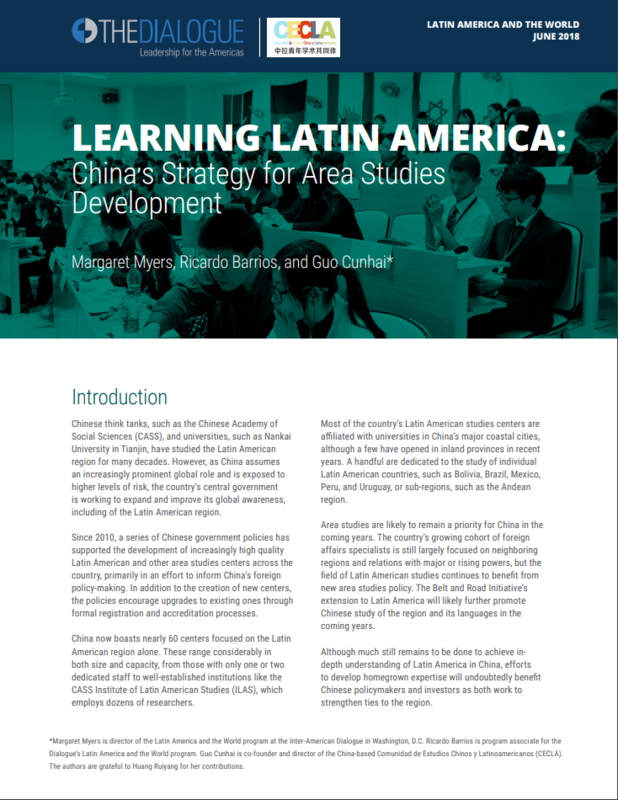 China has become a far more important commercial partner in Latin America than Japan. Abe will likely seek market access for Japanese firms in major economies such as Brazil, Mexico and Colombia. The prime minister is also expected to utilize stops in Chile and Mexico to promote the TPP, a treaty opposed by one in every two Japanese citizens and resisted by several domestic industries. Japan will also look to expand its stock of foreign investment in Latin America, which reached nearly 60 billion dollars (this excludes another roughly 60 billion dollars held in Caribbean financial havens) in 2012 and continues to increase. 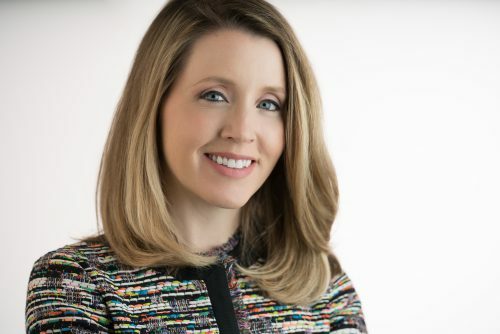 Infrastructure development in Brazil and ambitious economic reforms in Mexico present major new opportunities for East Asian firms. The two countries together accounted for approximately 60 percent of new Japanese investments in the region last year. Japan also has an interest in acquiring greater stakes in strategic resources throughout the region, such as natural gas and rare earth elements. On recent visits to Africa and Southeast Asia, Abe pledged new regional aid and investment packages worth $43 billion and $20 billion, respectively. But it is unlikely that deals of this scale will be extended to Latin America during Abe’s visit. 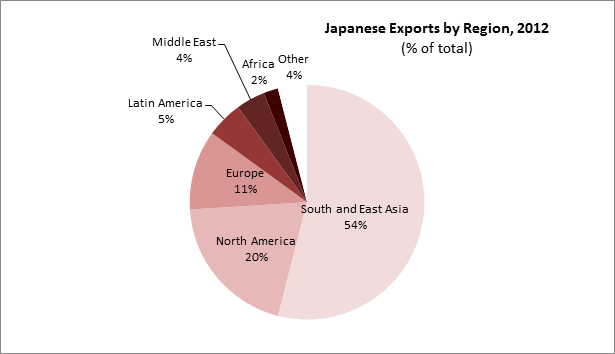 Japan already invests a considerable amount in Latin America. And Latin American nations remain a low priority for the Japan International Cooperation Agency (JICA). JICA provided a total of 37 billion yen (450 million dollars) to the region in 2012 – less than half that received by Africa and a fraction of the 581 billion yen in ODA destined for Southeast Asia. 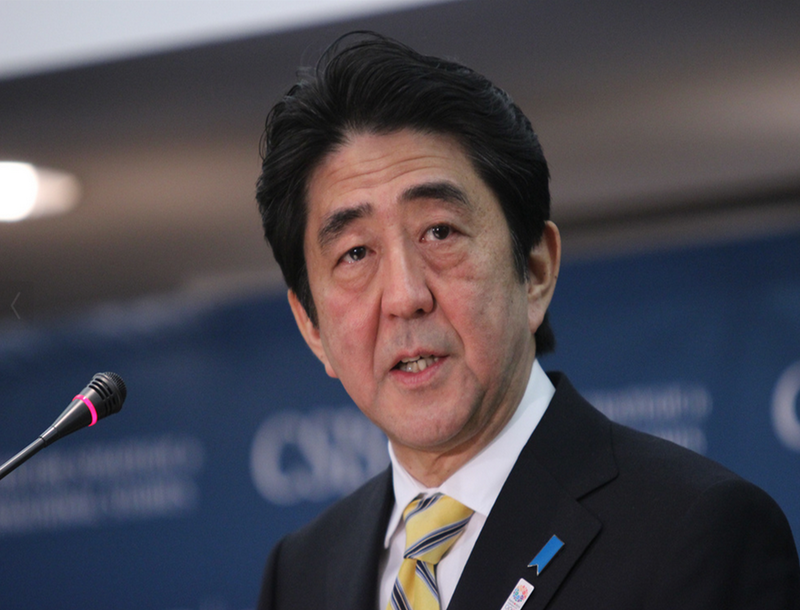 While in Latin America, Abe will also seek to drum up support for Japan’s foreign policy agenda. Tokyo’s recent overtures to governments in Southeast Asia and Africa are generally interpreted as a bid to counterbalance China’s growing influence in Asia and to increase support for Japan in international institutions. The prime minister’s visit will follow on the heels of an upcoming trip by Chinese president Xi Jinping to Venezuela, Brazil and Cuba. While in Brazil, Xi is expected to attend the 6th BRICS summit and the World Cup finals. Japanese leaders have also actively courted Latin American countries in their campaign for a permanent seat on the United Nations Security Council. In the years following Koizumi’s tour of region, six Central American nations announced their support for Japan’s bid. Abe may hope for a similar result from his upcoming visit to Trinidad and Tobago, a key member of the Caribbean Community (CARICOM). Xi used his visit to the island nation last year to simultaneously meet with a number of Caribbean heads of state. Whether Japan is similarly successful in its diplomatic overtures remains to be seen.